Clearly I’m behind in my reading since this is from 2013, though I will admit that it’s one of my older ARC’s. I’ve written before that I really like the Best American series and the essays are probably my most favored in the series (though the Science and Nature Essays might be a close second). However, this is not the sort of book that I will just sit and read, cover to cover, but instead it’s the sort of book that I will read an essay or two, put the book down, then come back to read a couple of essays some time later. I found that nearly all the essays selected were very well written and mostly engaging, or captured my interest. I think this is credit to the book’s editor Cheryl Strayed. Although the series is edited by Robert Atwan, each book has a different editor. Cheryl Strayed’s tastes appear to be similar to my own. In a collection such as this, it is typically difficult to pick a favorite, but it was easy to pick one that stood out – “The Exhibit Will Be So Marked” by Ander Monson. The essay starts with: “A couple of years ago, I asked friends and family to make me a mix cd for my birthday, hoping to get thirty-three mix cds, one per year I’d lived.” And I was hooked. Monson explains that he received 55 mix cds and he writes his essays, reflecting on the cds, and what the songs say to him. It’s a wonderful piece that really spoke to me. Whether it’s about family, friends, loved-ones or hated enemies, love or death, the essays here really sing and it’s nice to see that the essay, as a literary form, continues to do well. I recommend the book, as part of the series, and I definitely recommend this 2013 entry. Looking for a good book? 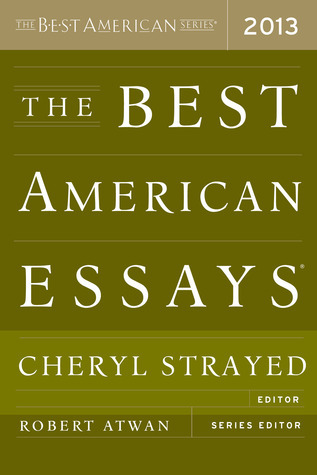 The Best American Essays 2013, edited by Cheryl Strayed, is a wonderful collection of essays and highly recommended.